I’ve waited to write this post for a while. Mainly because I wanted to offer something for every skin type, and with varying price points too. I can confidently say I would buy all my recommendations again and again, they’re all that great! They all do the same job but a little differently. It’s crazy to think when I first went “green” with my makeup, how little there was to choose from as far as foundations. Nowadays, there is a plethora to choose from…not that I mind the options, makes my job even better! Before I tell you all the juicy deets about foundations, I want to fill you in on some tips for getting the best application. There really is more to putting on foundation than slabbing it on and calling it good! Trust me when I tell you a good facial serum is your best friend. In the past, people would run from oils, and serums, thinking they made your skin greasy, but such is not the case! I don’t know about you, but I see bad foundation application daily…yeah, it ain’t pretty. For the smoothest application I like applying a facial oil of some kind and letting my skin even out. So many times there are certain areas of my face that may be drier than others, and this helps ensure my application is super even. I let mine soak in for 3-5 minutes, and then apply my foundation (Tip-brush your teeth after you apply it). Once I finish my application I’ll often set it with a spray mist of some kind, depending on what foundation I’m using. Jane Iredale has some great hydration sprays. I also really like Juice Beauty’s hydration mist. Again, it depends on the foundation you’re using and you’re skin type. My skin can go through phases where it’s really dry, and then some where I get an oily t-zone. When I’m really dry I’ll apply the hydration mist after application. If you’re really oily, try applying your foundation without a serum and see how it does. You may need more of a primer. If that’s the case I would recommend Vapor Stratus Soft Focus Instant Skin Perfector, a great primer, even for oily skin. Also, Jane Iredale Absence Oil Control is great for oily skin types and as a good primer base. Oh how I love this little pot of goodness! I’ve literally been using it since I went “green” five years ago and haven’t looked back. It’s a staple. What makes it so great? Well it acts like a concealer but also a foundation. It’s super blendable and smooth. It covers redness, discoloration and blemishes but doesn’t feel heavy at all. I would say it’s super versatile. I can dress it down in a sense, and just dab on a bit for the gym, or if I’m staying at home all day and don’t want to get too dolled up, but still look presentable. 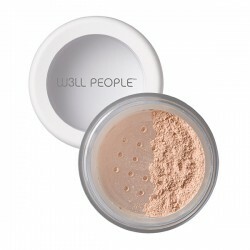 For a more polished look I like applying a mineral setting powder (more on my fave below). It’s moist and dewy and gives you that natural coverage we all crave. It’s not one you would have to put a facial oil on before if you were just lightly wearing it as a concealer, but If you’re using it as an overall foundation I would apply an oil. I use #22, a light to medium color with a yellow base. I’ve found application is best with just your fingers. It’s great for dry to combination skin, but can be used by oily skin. I would just make sure and set it with a mineral setting powder (again more info. on my fave powder below). It’s $36, but lasts forever. Trust me, you want this puppy in your makeup bag, stat! This company is a little newer on the natural makeup seen, but that didn’t stop them from making an amazing foundation. Every time I wear it I get compliments…seriously! It photographs well too. This foundation is definitely more for the dry/combination skin camp. It’s super dewy and moisturizing. It’s almost more of a tinted moisturizer when it comes to coverage. It doesn’t cover quite as densely, but still covers my redness. I often will add a mineral setting powder to this as well. I would recommend this for anyone with more mature skin or dry/combination that doesn’t need a lot of coverage, but want’s a polished look. I apply it with my fingers. It’s $38 but this will literally last forever, the compact is huge! I have the colors, Seville and Marino. This is a great all around foundation and I love that it comes in a stick. I just apply to my cheeks, forehead, and chin and blend out with my fingers. This is for combination to oily skin types. My skin tends to be more dry, but can be oily in the summer, and it was perfect for the warmer months. It’s pretty similar in coverage to the RMS Un-Cover Up. 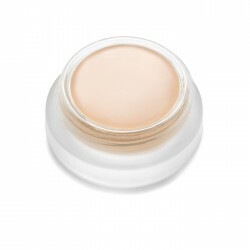 Covers redness, blemishes, and discolorations and can be used like a concealer. However, it does feels a little drier than the Un-Cover Up or Au Naturale Foundation, but it still feels very light and airy on the skin. This also can be used with a setting powder. It runs for $39.75. I have the color #3. This is an amazing product, one of a kind! Really, guys I just love this stuff. I have tried many natural powders and was not impressed. This one takes the cake. Why is it my #1? Well, the biggest reason is it isn’t drying or cakey feeling. You know the feeling I’m talking about with other mineral powders?? Yeah, it’s not like that. 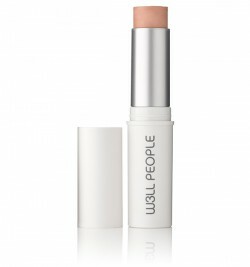 It blends in seamlessly, and smoothly and doesn’t get caked in any fine lines. It doesn’t look like you’re wearing a powder because it blends so well. I love using this after foundations to set them (as mentioned above) or by itself. It also works great as an eyelid primer. I would recommend this for dry, combination or oily skin. If you have dry skin, you may like it as a mineral setting powder, or perhaps midday when you might need a little t-zone clean up. I use a large powder brush to apply mine, but you could use a kabuki brush as well. I have the color 15 in medium neutral. It’s $31.50, a more budget friendly mineral powder. This is considered the Mercedes of foundations for “green” beauty. It definitely lives up to the hype! If your looking for a full coverage foundation that stays put all day, then this is your gem. I like to compare it to how a main stream foundation feels. You know those Estee Lauder ones that are filled with toxic chemicals, but work and last. 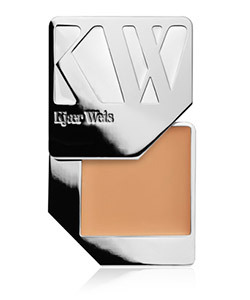 Well, say goodbye to toxins and hello to Kjaer Weis. It will cover anything, but it doesn’t look heavy. One thing I must say about it is your skin really does to need to be prepped with some kind of oil before application. The foundation can seem heavy and thick otherwise, because it will cling to dry patches or unevenness. Also, using a foundation brush of some kind is best for optimal results. I’ve found it applies so much better than with your fingers. It’s more of a tapping motion than a rubbing. It also can be used as an eyeshadow primer. It offers more of a matte finish. I have the color Just Sheer. I would recommend it for all skin types. It really works for them all, just different measures need to be taken depending on your skin. This isn’t cheap, at $68, it’s definitely an investment. However, after the first purchase the price drops to $40. The first time around you have to pay for the re-usable compact, after that you just by the refill. There you have it, my top foundation picks. Do you guys have some natural foundation faves?? Leave me a comment, I would love to hear! I haven’t tried it but I just read your review and now I want too! 🙂 I see we have a lot of similar faves as well. I haven’t tried the Ilia either but would like too. Have you used Juice Beauty’s CC Cream? I really like it! Haven’t tried Jane’s yet. Love your blog! This is awesome! Thank you so much – do you know if any of these would be available at Sephora? I have a giftcard..
Hi! Your blog is Awesome. Do you have any feedback on Pacifica beauty and honesty beauty makeup? Thanks. Hi Juliana! Thank you! Yes, I did a post on honest Beauty here https://gurlgonegreen.com/2015/09/24/honest-beauty-review/ I haven’t used any of Pacifica but I need too. They used to be not so great as far as ingredients but they’ve really cleaned them up over the years. I know some of their products have phenoxyethanol in them but I wouldn’t mind trying the ones that didn’t. i love your ideas, so i finally used RMS and love the brand. I am use to using a CC cream because it has sunscreen with the product. What do you use for sun screen cover pre-makeup? Hi Jane! Thank you! I absolutely love Hynt Beauty’s Sun Prep-It’s perfect for before makeup and has an spf of 30. Not greasy at all!! Yes, FitGlow is a great option all around. Really like it!